Sekai Daisensô (1961) - Sci-fi-central.com. 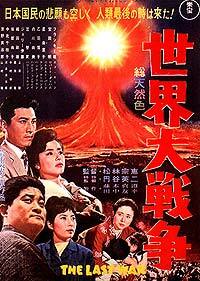 Japan  1961  110m   Directed by: Shûe Matsubayashi.  Starring: Furankî Sakai, Akira Takarada, Yuriko Hoshi, Nobuko Otowa, Yumi Shirakawa, Chishû Ryû, Jerry Itô, Eijirô Tôno, Sô Yamamura, Ken Uehara, Seizaburô Kawazu, Nobuo Nakamura, Chieko Nakakita.  Music by: Ikuma Dan. Two superpowers are speeding toward war. In the middle are the Japanese and the people who live in Japan. We watch as the impending doom affects the lives of several regular Japanese, and we watch as the troops in the bunkers prepare to send their missiles. Unlike the Mel Gibson "epic" THE PATRIOT and the upcoming PEARL HARBOR, this Japanese film SEKAI DAISENSO teaches us the real meaning of war and what war can do to us. SEKAI DAISENSO, or known in America as THE LAST WAR, is about the possibilties of World War III beginning. And indeed it does begin and causes the world to end. Scenes of famous landmarks and buildings exploding to bits provide a good special effects highlight (after all, this film is made by Toho who also gave us the Godzilla films). But SEKAI DAISENSO does not deliver the special effects to wow the audience. The effects are to show us what would happen if we set off nuclear bombs in order to end a war quickly. The film also has a romance angle between a young navy officer (Akira Takarada) and a young girl (Yuriko Hoshi), while the young girl's parents (Frankie Sakai and Nobuko Otowa) live their daily lives and try to cope with both good and bad memories. This angle between the romantic couple and their parents does not interfear with the film at all. It sets the whole film in motion. One particular sequence featuring Sakai standing at his window saying that the family will not die out but will go on living gives the film a powerful emotion of inocent people who are about to die in a war that will take their lives. Very sad isn't it. Director Shue Matsubayashi brings SEKAI DAISENSO to life with his smooth and artistic direction. He is also perfect for directing this film because Matsubayashi was part of the Navy during World War II, so his experiences with war is also perfect for this film. Also Eiji Tsuburaya's groundbreaking special effects also put the message of war in front of our eyes very clearly. The American release from Brenco Pictures was heavily edited and rearranged and is a bit of a disappointment due to the somewhat crude and out of place English dubbing. Though released theatricaly in the United States, badly panned and scanned video copies from television have turned up. However, I feel that both the American and Japanese version need to be released on video as soon as possible before the interest in these films begin to fade away. SEKAI DAISENSO is told from the Japanese viewpoint on what war is like. 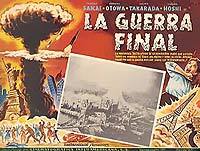 SEKAI DAISENSO is not Japanese propoganda, but a film made by people who have experienced the cruel meanings of war through the Hiroshima bombing, which is also brought up in the film as well (but breifly in the American version). SEKAI DAISENSO teaches us that war is not something that we or the whole world shold get involved in or even create for that matter. War is not a good thing indeed and the whole world should prevent war from happening. If we don't, then war will pull us in and the world will end up just like it did in the film: a civilization that has been destroyed and the only thing that is left is some crumbled up buildings and corpses. Review by gypsykoenigbill from the Internet Movie Database.